While places like New York might dominate when it comes to the sheer number of towering skyscrapers present, London has a wealth of unusual buildings about the city that more than match the boldest designs of other major capitals. In keeping with London’s reputation for innovation and embracing the different, The City has some stunning examples of modern architecture that don’t conform to the rules when it comes to shape and form. With this in mind, we’ve put together this piece showing the most unusual architecture, and best of all they’re all easy to see from the Devonshire Hotel Paddington. Most municipal buildings follow a very set pattern, or they make use of a historic building for something like a city hall. But not London. Instead of taking the usual route, City Hall is a sloped, segmented building that almost seems to slide to one side. Right up against the Thames, the design of city hall is actually about more than looks. Designed by architect Norman Foster, the unique shape and construction of the building means that it requires much less energy for heating than many other buildings of its size. It’s also worth taking the time to journey inside for a look at the unique interior of the building and to climb the five hundred metres to the top floor for stunning views out over South Bank. Getting there from Montcalm’s accommodation near Paddington Station is easy, and it won’t take you more than 25-minutes. If you were to ask many people where 20 Fenchurch Street is, they might give you a blank stare. If, however, you asked after the ‘Walkie Talkie Building’ then they would definitely know what you mean. And once you see the building, you’ll understand how it got that unique name. Wider at the top than the bottom and carrying an almost slouched look, 20 Fenchurch Street is one of the most unique and awe-inspiring buildings anywhere in the capital. Dominating nearby buildings, the structure is a marvel of modern design and architecture, showcasing a thoroughly modern outlook. If you venture up to the top three floors of the building, you’ll find a glorious botanical garden and viewing platforms that offer fantastic views over all of central London. It’ll only take twenty minutes to make the journey from Devonshire Hotel Paddington, and the views alone are worth the trip. 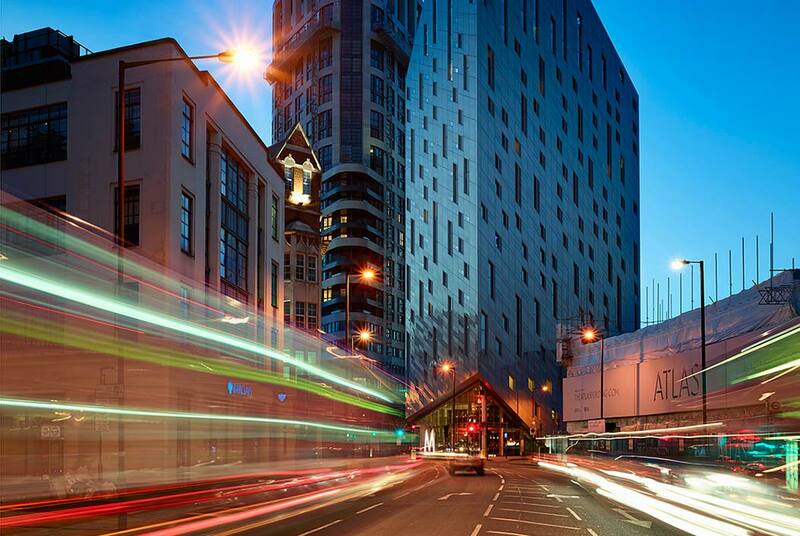 Residing in the heart of Tech City, M By Montcalm Tech City is one of the most innovative – and initially confusing – buildings you can find anywhere in London. Stocked inside with smart technology, the exterior of the building – designed by architects Squire and Partners – has a stretched, triangular look that, from the front, makes the stunning building appear as something of an optical illusion. It’s once you venture closer and to the side of the building that you can understand the ingenious use of space and design that makes it one of the unmissable architectural sights of the capital.